The links below provide connection strings to OGC web map services (WMS) and web feature services (WFS) for MODIS fire-related products. WMSs provide access to a georeferenced image of a map for viewing only while WFSs provide streaming geographic features that can be queried and analyzed. Both types of services can be ingested in GIS client applications that support OGC WMSs and WFSs. AVHRR and GOES fire-related products are currently not provided by the Active Fire Mapping Program as WMSs and WFSs. MODIS Fire Detections (Current) - 1 km MODIS fire detections for the current year categorized by time of detection; last 6, 12 and 24 hours, and cumulative detections previous to the last 24 hour period. Current large wildland fire incidents and baseline geographic layers are also provided. 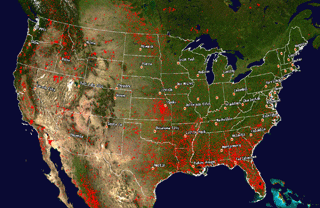 MODIS Fire Detections (Historic) - Cumulative 1 km MODIS fire detections for each calendar year from 2001 to 2009. VIIRS-AF (NASA) Fire Detections (Current) - 750 meter VIIRS-AF fire detections for the current year categorized by time of detection; last 6, 12 and 24 hours, and cumulative detections previous to the last 24 hour period. Current large wildland fire incidents and baseline geographic layers are also provided. VIIRS I Band Fire Detections (Current) - 375 meter VIIRS I Band fire detections for the current year categorized by time of detection; last 6, 12 and 24 hours, and cumulative detections previous to the last 24 hour period. Current large wildland fire incidents and baseline geographic layers are also provided. Landsat 8 Fire Detections (Current) - 30 meter Landsat fire detections for the current year categorized by time of detection; last 6, 12 and 24 hours, and cumulative detections previous to the last 24 hour period. Current large wildland fire incidents and baseline geographic layers are also provided. MODIS Fire Detections (Current) - Cumulative 1 km MODIS fire detection centroids for the current year as streaming geographic features. MODIS Fire Detections (Last 7 Days) - 1 km MODIS fire detection centroids for the last 7 days of the current year as streaming geographic features. VIIRS-AF Fire Detections (Current) - Cumulative 750m VIIRS-AF fire detection centroids for the current year as streaming geographic features. VIIRS-AF Fire Detections (Last 7 Days) - 750 meter VIIRS-AF fire detection centroids for the last 7 days of the current year as streaming geographic features. VIIRS I Band Fire Detections (Current) - Cumulative 375m VIIRS I Band fire detection centroids for the current year as streaming geographic features. VIIRS I Band Fire Detections (Last 7 Days) - 375 meter VIIRS I Band fire detection centroids for the last 7 days of the current year as streaming geographic features. Landsat 8 Fire Detections (Last 7 Days) - 30 meter Landsat fire detection centroids for the last 7 days of the current year as streaming geographic features.